You can add your own lyrics to Setlist helper. There several ways to do it. Open the main menu of the app and tap Songs. Tap the plus button at the top of the page. This will open the “Edit Song” page shown below. Fill in all the data you require on this page. Then tap “Edit Lyrics…” as shown below. Fill in the information you need and tap “Save”. That will take you back to the Song Catalog. Tap the newly added song and you will see the screen below. To add custom lyrics tap “Edit” or tap the menu with the 3 dots in the upper right and choose “Edit”. You will see the screen below when you edit. If you create chord pro files with either of these utilities you import them following the instructions here. The screen above has 2 buttons on the top toolbar. 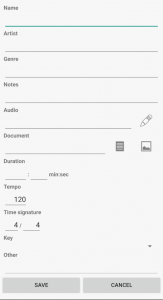 Insert chord pro tag – Inserts a chord pro tag where your cursor is at. 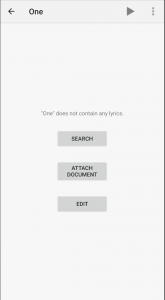 Checkbox – save the lyrics. Not all chord pro tags are support. More will be supported in the future but refer to the chord pro help page for details on what is supported. An easier way to add lyrics may be on your PC or Mac. 1. Open the main menu and tap Sync. This will put all your data at www.setlisthelper.com. 2. Go to the Song Catalog. Click on “View Lyrics or Add Lyrics”. 3. 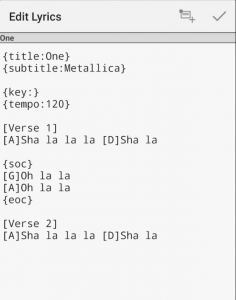 Copy all your lyrics and paste them into this tool http://ukegeeks.com/tools/. Convert the lyrics and copy them. 4. Paste them back to www.setlisthelper.com.